You can actively participate with HUD, EPA, and CDC to spread the word about National Lead Poisoning Prevention Week by sharing messaging on social media using the hashtags #leadfreekids and #NLPPW2018 and tagging @HUDgov, @HUDHealthyHomes, @EPA, and/or @CDCgov to help mobilize individuals and communities to take action to reduce the risk of lead exposure in their environments. This year HUD, EPA, and CDC will be posting social media messages corresponding to daily themes. Monday, October 22nd, 2018: How Do You Know if There is Lead in Your Home? You can retweet or share messages sent from these social media accounts, use the sample social media posts provided below corresponding to the daily themes, or write your own! How Do You Know if There is Lead in Your Home? CDC’s Solve the Outbreak app lets you step into the shoes of a Disease Detective! Play through a series of disease “outbreaks,” one of which is based on the international response to the to lead poisoning crisis in Nigeria. In “The Village of Gold,” players read through screens of clues to determine what might be causing the lead poisoning outbreak, how it started, and how it’s spreading. Players can also access webpages with lead poisoning prevention information and a link to learn about the real Nigerian lead poisoning crisis. Learn more about the Solve the Outbreak app here! Copy and paste the code to add these buttons and badges to your website, blog, or social networking profile. 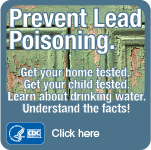 Let your website visitors know how to stop lead poisoning and where to get more information. Lead Glossary[PDF – 1.34 MB] A plain-language dictionary that gives the meaning of words you often hear or read about lead. More lead poisoning prevention Tools and Training. Dr. Mary Jean Brown, discusses the importance of testing children for lead poisoning, who should be tested, and what parents can do to prevent lead poisoning. Dr. Maria Doa, Director of the EPA National Program Chemicals Division, discusses EPA’s new rule for renovations, repairs, and painting activities. For more information about this kit, contact LeadInfo@cdc.gov.